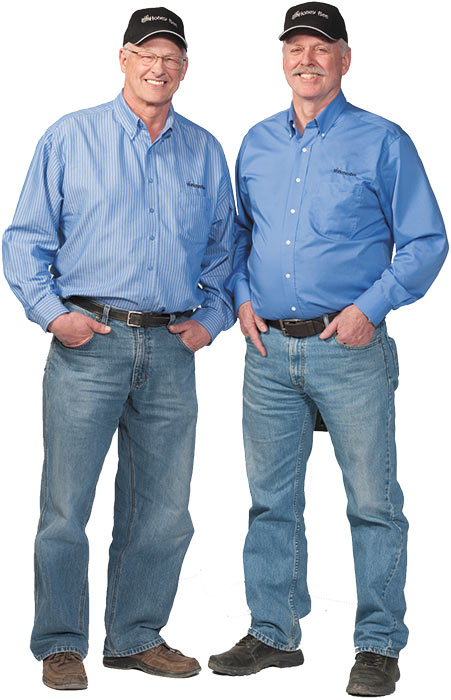 Greg and Glenn Honey grew up on a farm in Bracken, Southwest Saskatchewan. In 1979, they started building their own equipment to meet their own needs on their farm, the first major project being a 425HP tractor. From a 67′ self-propelled swather to a power-unit sprayer combo, they built or adapted nearly everything that they needed for their farming practice. Naturally, the duo began marketing some of their products. The most popular among these was the Grain Belt Header, which offered increased capacity, better cutting, and better feeding. Its rugged and simple design also ensured that the product would be a staple on farms for years to come. In the fall of 1987, the Grain Belt platform was growing in popularity, so they decided to make the move to Frontier, Saskatchewan. Their new location had enough space for increased production capacity and a product line expansion. Today, Honey Bee has over 100,000 square feet of production and warehousing space, enabling them to provide customers from around the world with a diverse offering of draper platforms for a wide variety of crops and conditions. Honey Bee is evolving the tradition of the draper platform from the Grain Belt and is setting its sights on the future through the new AirFLEX platform, which carries forward the simple robust design of the Grain Belt, while meeting the needs of today’s producers. Honey Bee has come a long way from those days back on the farm. With a strong commitment to product research and development, Honey Bee’s objective has always been to manufacture equipment that farmers want and are happy to own.